That line is spoken at one point during Hugo, the new film by Martin Scorsese (Raging Bull, Goodfellas, The Departed), and though the film had already clicked with me and my own sensibilities, it was at that moment I realized the main audience for Hugo: people who love movies. Using the finest form of 3D photography I’ve ever seen, Scorsese weaves the tale of 12 year old Hugo (Asa Butterfield), an orphan boy who maintains the clockwork for a Paris train station. Hugo survives by knicking bits of bread from the station’s bakery and swiping mechanical parts from the toy maker’s shop. He uses these spare parts to keep the clocks wound and also to rebuild the automaton his deceased father left him. The toy maker (Sir Ben Kingsley) soon grows wise to Hugo’s thieving and offers him a job in the shop to keep out of trouble. Hugo meets the toy maker’s god daughter Isabelle (Chloe Grace Moretz) and the pair embark on an adventure that uncovers the mysterious past of both Hugo’s father and the toy maker. This mysterious past involves old movies, specifically the experimental films by the Lumiere brothers and George Méliès. These film makers were the first to play with the true potential film had as an artistic medium, and the result felt like the greatest magic trick ever played. Scorsese references these films with various visual cues and themes throughout Hugo, and he even inserts clips from famous works. One highlight is A Trip To The Moon, whose iconic shot gets converted into 3D to great effect. As a student of film history and as just a lover of film, Hugo treats the cinema with such reverence and beauty that I felt a tear come to my eye on multiple occasions. But Scorsese isn’t content to merely bask in the glow of great works. He has created a stunningly beautiful Paris here. The city is having a good year with both this and Midnight In Paris presenting her in all her glory. Snow wafts over the city scape and drifts over the audience as the sublime 3D pulls us into the screen. If you see Hugo, you have to see it in 3D. Scorsese clearly put a lot of thought into each shot, using the extra dimension as more then just eye candy. For Scorsese, who many believe to be the greatest director working today (myself included), there’s an artistic decision behind every moment, and the 3D is no exception. Above all this feels like Scorsese’s most personal film. Like ET, Almost Famous, or America Graffiti, there’s a lot of the film’s director in here. Hugo watches the world, disconnected as he stares from behind the glass clock face. As a boy Scorsese was kept indoors due to asthma, and his only escape was via the cinema. Hugo has the same adoration for movies. The two also share the same love for the entire film-going experience. Buying a ticket, sitting in your seat, hearing the projector start up and getting the faint hum in your stomach once the lights turn down. We sometimes forget how magical the movies can be, and Hugo is about never losing that feeling, and never losing sight of our own selves. Hugo reminds us how it feels when everything just clicks into place, and we know we are exactly where we’re supposed to be. This holiday season, there’s no finer gift than that. Hugo is now playing in theaters everywhere. 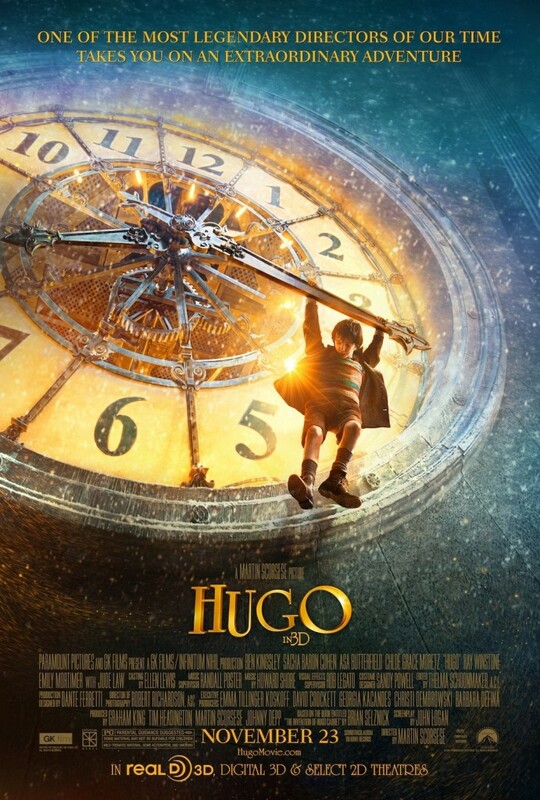 There are currently 1 Comment on Review: “Hugo” Brings Magic Back To The Movies. Perhaps you would like to add one of your own?